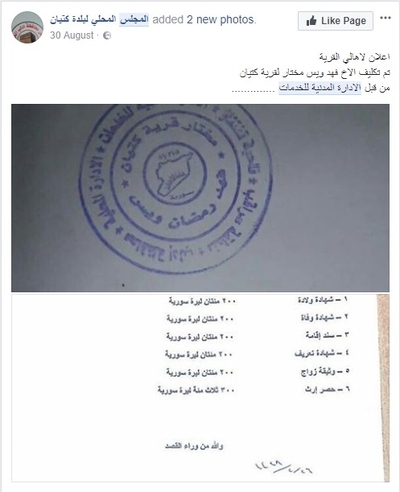 The archive below of this department's documents will be continually updated, similar to the archives of Islamic State administrative documents, Jabhat al-Nusra judicial documents and Jabhat al-Nusra billboards and murals. [Update for 2017: Jabhat al-Nusra has since evolved into Jabhat Fatah al-Sham in summer 2016 and as of January 2017 Hay'at Tahrir al-Sham, which remains a jihadist entity but is no longer affiliated with al-Qa'ida. The 'Public Administration for Services' has now become 'The Civil Administration for Services.' Documents from this new body are archived here for convenience]. This amnesty is considered binding for aforementioned violations until the date of its issuance, and any violation after that will require financial fines according to the list of violations accompanying this amnesty. And God is the One behind the intention and He guides the path. Praise be to God and prayers and peace be upon our Prophet Muhammad (SAWS). 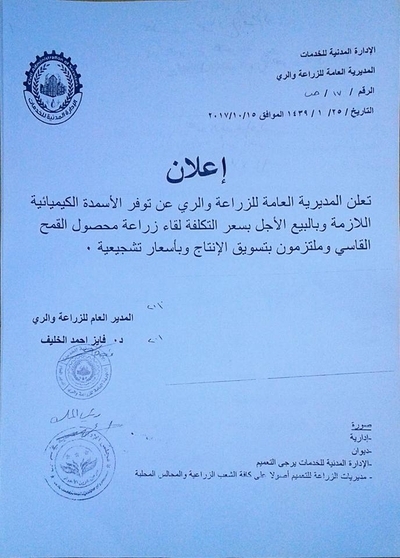 Jabhat al-Nusra- the Public Administration for Services: Hama Area- announces the securing of water for all the Muslims in the town and fixes a maximum price of 50 Syrian pounds for one barrel coming to the home, and any person attempting to sell or buy at a price of more than 50 Syrian pounds will expose himself to inquiry. 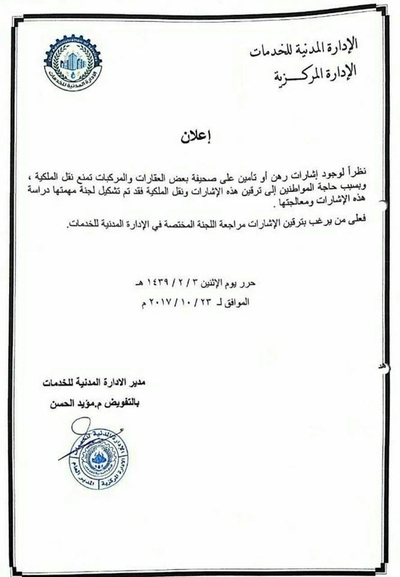 Similarly we also warn the Muslim brothers not to listen to the rumours on the subject of bread and we inform and remind them that the bakeries affiliated with the Public Administration for Services will remain continually operating throughout the month of Ramadan by God Almighty's permission whatever comes of the expenses and prices. 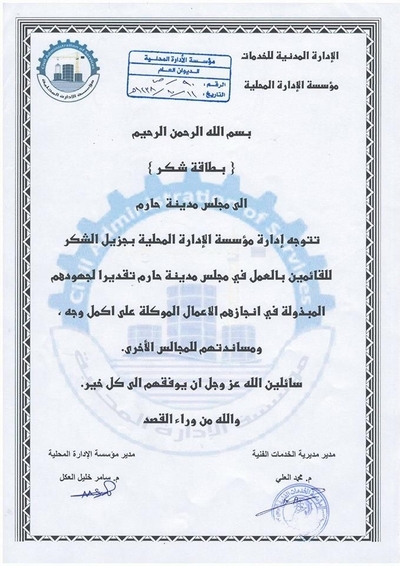 A new misfortune strikes the Public Administration for Services and all those workng in it with the news of the martyrdom of the engineer brother Muhammad al-Omar- 'Abu al-Majid al-Halabi': the director of the electricity division as a result of his wounds with which he was struck as a result of the falling of a barrel bomb on al-Saliheen quarter in the city of Aleppo days ago. We ask God to accept him and to bestow endurance and condolence on his family, for he was among the best workers in the administration and we will not forget his words that he frequently repeated: "By God we did not come out except to serve the Muslim populace in the path of God."
. Electricity, water, mechanics, environment, accounting, media in addition to those who can drive all types of cars.
. Should be able to handle the pressure of work. So those who wish to work are asked to go to the Workers Affairs division and record their ID statements. The electricity directorate in the Public Administration for Services thanks the Civil Defence Directorate and that is for their great efforts in the path of serving the populace, when today a great fire broke out in the al-Sakhur power plant [east Aleppo area] and the Civil Defence division hurried to extinguish the fire and praise be to God: were it not for the rapid intervention of the Civil Defence heroes, the result from it would have been great material damage. 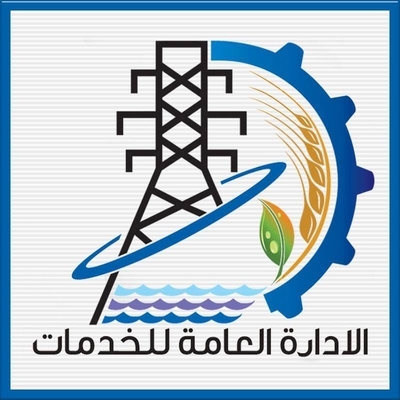 It is absolutely forbidden to connect any additional electricity line (not found with the consumer) from another outlet besides the main outlet, and that applies to any person, and every line that is connected will be considered a violation, and it will be removed, and its owner held accountable, and he will be fined a sum of a minimum of 5000 Syrian pounds in recompense for what he has committed. 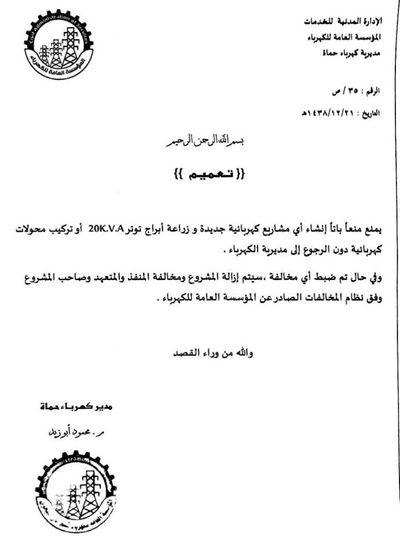 It is absolutely forbidden to establish any new electricity projects and plant towers of 20 K.V.A. or install electrical transformers without recourse to the electricity directorate. And if any violation is caught, the project and the violation of the implementer, contractor and owner of the project will be removed according to the system of violations issued by the general foundation for electricity. With our striving to unite efforts and bring them together aiming for a united civil administration of central institutions, you are asked to hand over all offices affiliated with the councils to the specialized institutions according to principles. - Police apparatus and judiciary. 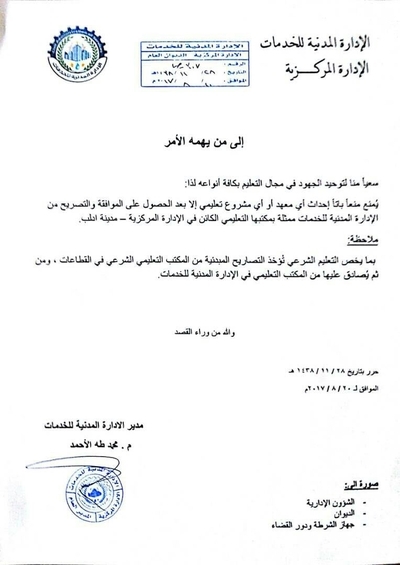 With our striving to unite efforts in the realm of education in all its types, it is absolutely forbidden to establish any educational institution or project except after obtaining agreement and statement of consent from the civil administration for services embodied in its educational office located in the central administration in Idlib city. Regarding Shari'i education, statements of consent in principle are taken from the Shari'i education office in the sectors, and from there is verification by the education office in the civil administration for services. 1. 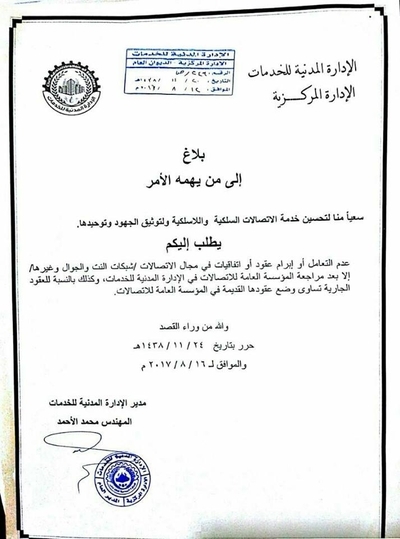 It is absolutely forbidden to export wheat to areas controlled by the regime under penalty of inquiry. 2. 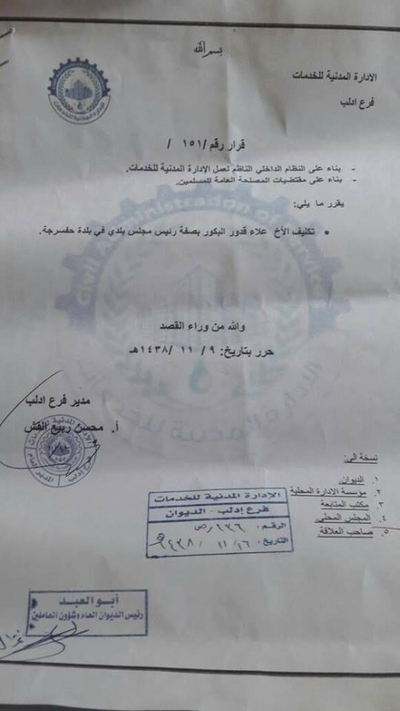 It is forbidden for merchants to play with wheat prices under penalty of inquiry. 3. This notification is to be conveyed to whoso is obliged to implement it. 4. This notification is to be published in all rooms and on all social media pages. - Prohibition on infringing on forests and woods for whatever reason. - Compliance with the notification beginning from its date under penalty of inquiry. - Publishing this notification through available means of publishing. Imams of mosques: to spread through pulpits. All security and implementation groups entrusted to implement the notification in the liberated areas under penalty of inquiry in the event of shortcoming. The civil administration for services desires that higher education should be independent from all political and military bodies and that the ideal circumstances should be secured for the course of higher education. 1. Dr. Muhammad al-Sheikh as head. 2. Dr. Ahmad Firas Aloush as member. 3. Dr. Jum'a al-Omar as member. 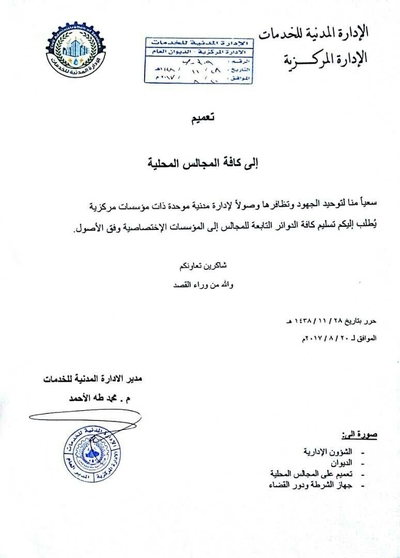 As a preparatory committee whose task is to connect with the universities operating in the liberated north of Syria to form an independent higher education council. 3 Dhu al-Q'ida 1437 AH corresponding to 26 July 2017 CE. To all merchant shops present in the Bab al-Hawa area, you are asked to remove infringements, material and cars present in the area and stick to your shop only. This warning is to be considered tantamount to a personal notification to every shop in violation and car in violation. A deadline of three days is to be given from date of notification and distribution of the publication- 4 Dhu al-Q'ida 1438 AH corresponding to 27 July 2017 CE- in order to remove the violation and after the end of it, there will be a reliance on removing it by force. And the one who has warned has been excused. Published on 3 Dhu al-Q'ida 1438 AH corresponding to 26 July 2017 CE. As we strive to improve wired and wireless connections and document and unify efforts, you are asked not to deal with or ratify contracts or agreements in the field of connections/Internet and mobile networks etc. 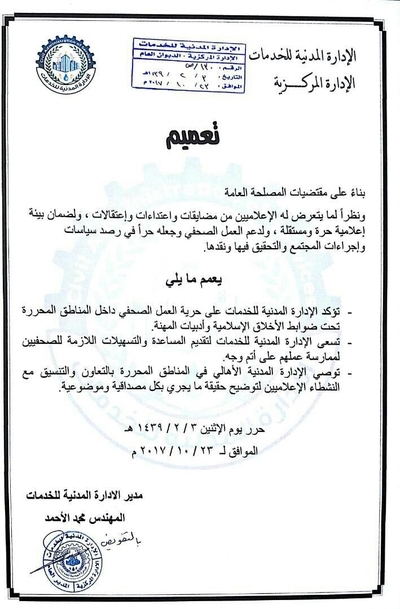 except after going to the general foundation for connections in the civil administration for services, and likewise with regards to ongoing contracts, the situation of their old contracts is to be settled in the general institution for connections. Published on 24 Dhu al-Q'ida 1438 AH corresponding to 16 August 2017 CE. 1. 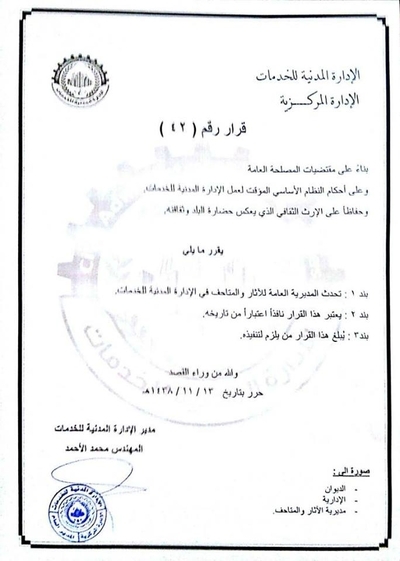 The establishment of the general directorate for antiquities and museums in the civil administration for services. 2. This decision is considered in effect beginning from its date. 3. This decision is to be conveyed to the one obliged to implement it. 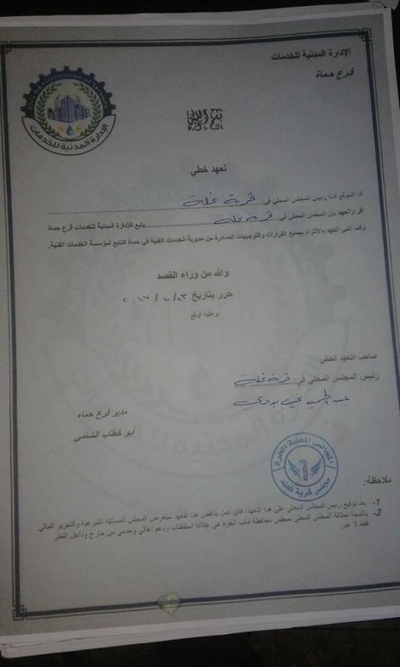 I who sign this document, the head of the local council in the village of Nahleh, affirm and pledge that the local council in the village of Nahleh is to be affiliated with the civil administration for services, Hama division. 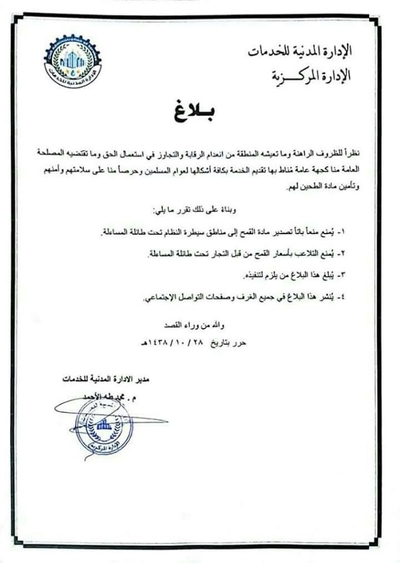 And thus I pledge to comply with all the decisions and directives issued by the technical directorate of services in Hama affiliated with the technical foundation of services. Author of the written pledge: head of the local council in the village of Nahleh. 1. After the head of the local council signs this pledge, any work contravening this pledge will expose the council to Shari'i inquiry and a fine. 2. 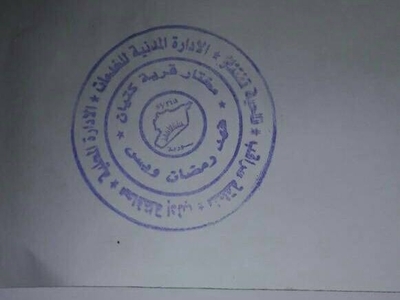 Regarding the relationship of the local council with the Free Idlib Provincial Council, it is a relationship of recruitment and relief and services support from outside and inside the area only, and nothing else besides that. - According to the internal system organizing the work of the civil administration for services. - According to the requirements of the public interest for the Muslims.
. 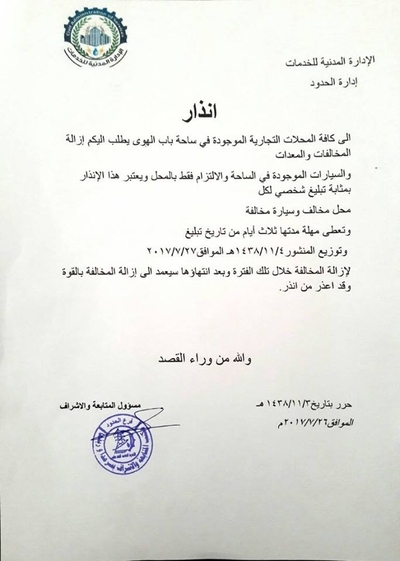 Appointing the brother Ala' Qadur al-Bakur as head of municipal council in the municipality of Hafasraja. Published on 9 Dhu al-Q'ida 1438 AH. The administration of the local administration foundation extends sincere thanks to those working in the Harem city council in view of their efforts expounded in their accomplishment of the entrusted tasks to the fullest extent, in addition to their aid to the other councils. We ask God- Almighty and Exalted is He- to grant them success for all the best. And God is the one behind the intention. 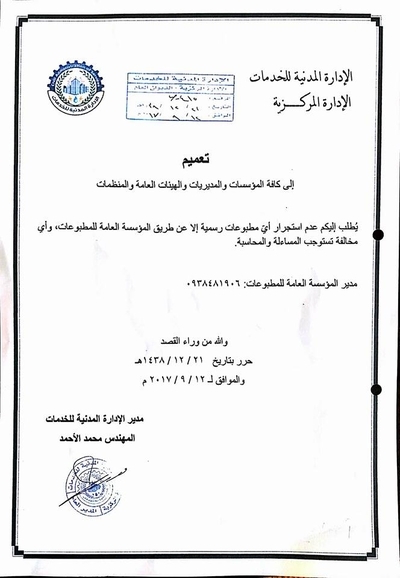 The general directorate for local administration is considered the sole party authorized to track the affairs of the local councils in liberated areas. Published on 29 Dhu al-Q'ida 1438 AH corresponding to 21 August 2017 CE. You are asked not to distribute any official publications except through the general foundation for publications. Any violation will require inquiry and accountability. 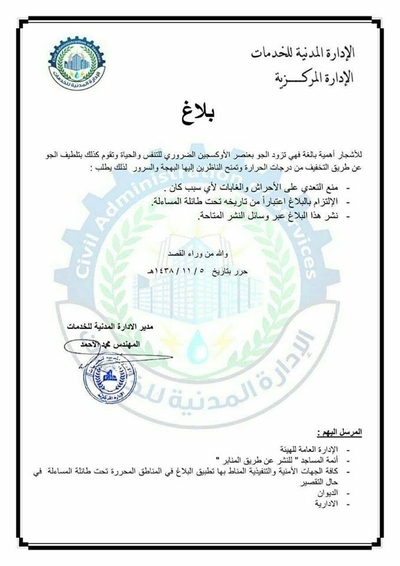 The general directorate for agriculture and irrigation announces the availability of the necessary chemical fertilizers and with credit sale at the price of the cost in exchange for the cultivation of the durum wheat, with the obligation to sell the product at incentive prices. 1. Establishing the general directorate for sports and youth in the civil administration for services. 2. Cancelling decision no. 98 on date 6 Dhu al-Hijja 1438 AH stipulating the establishment of the sports office in the civil administration for services. 3. This decision is considered valid from this date. 4. This decision is to be distributed to all public parties. Published on 27 Dhu al-Hijja 1438 AH corresponding to 17 September 2017 CE. In view of the existence of mortgage liens for the property deed of some of the real estate and vehicles that forbids the transfer of ownership, and because of the citizens' need to remove the mortgage liens and transfer ownership, a committee has been formed whose task it is to study these liens and rectify them. 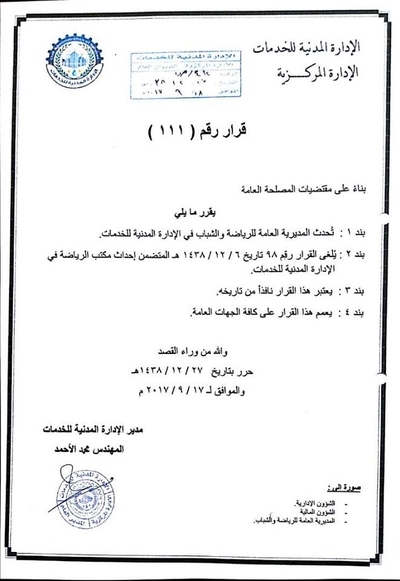 Whosoever desires to remove these liens, go to the specified committee in the civil administration for services. 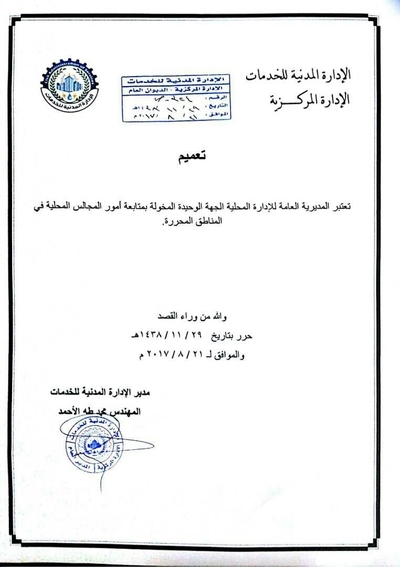 - The civil administration for services affirms the freedom of press work inside the liberated areas under regulations of Islamic ethics and disciplines of the vocation. - The civil administration for services strives to offer necessary aid and facilitation for journalists to carry out their work to the fullest extent. 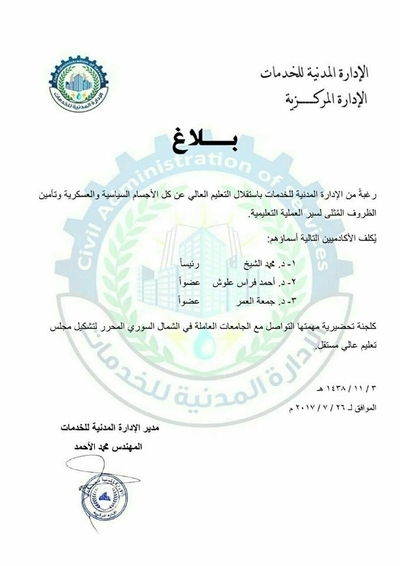 - The civil administration counsels people in the liberated areas to cooperate and coordinate with media activists to clarify the truth of what is happening with all credibility and objectivity. Corresponding to 23 October 2017 CE.